Hertford Art Society is fast approaching its 67th Open Exhibition. One of the most prestigious Open Exhibitions in the South East, it welcomes amateurs and professionals alike. The exhibition takes place at Cowbridge Halls, Cowbridge, Hertford SG14 1PG and runs from Sunday 5th May to Saturday 18th May 2019 (closing at 2.30pm). To enter, you will need to pay £5 on handing-in day to become an Associate Member (temporary member for the duration of the exhibition). You can then submit up to 6 pieces of work at £3 per entry. Works to be exhibited will be selected by a judging panel of four professional artists who are completely independent of the Society. Handing-in day is Saturday, April 27th between 8.30 a.m. and 10 a.m. only. There are two private views: Saturday, May 4th in the evening and Sunday morning, May 5th. So, whether you are a ceramicist, a painter, a sculptor, if mixed media is your thing, or perhaps you prefer pastel, graphite, printing, in fact, pretty well any artistic medium with the exception of photography, here is your chance to exhibit with the best. For full information, please download an entry form and labels from our website, read the terms and conditions carefully and bring along, on handing-in day, the completed entry form, your entry fee and your finished work/s ready for hanging/displaying. Unselected works will need to be collected from 3:00 to 4:30 on the afternoon of Saturday 27th April. This is a great opportunity to exhibit, perchance to sell. Each summer following the indoor Winter Programme and the Open Exhibition, Hertford Art Society Members enjoy painting and sketching out of doors on Tuesday evenings at various venues in the Hertford Area. Members usually meet at around 7.00pm (or beforehand by private arrangement) for sketching & painting, then gather socially in the suggested public house when the light fails. Any local artists from these villages or areas are welcome to come along for the outdoor painting sessions etc. Summer Programme 2019 (pdf) - click here for more details. 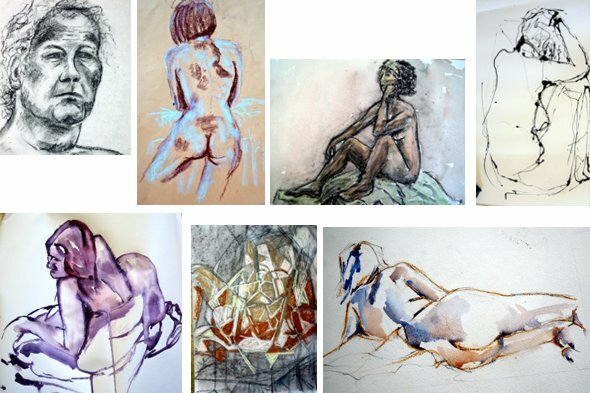 WHY LIFE DRAWING AND PAINTING? – Some may say it is old fashioned, but practising Life Drawing enhances observation and accuracy. Interpreting the shape of the human body trains the artist to see almost every curve line and subtle undulation found in nature. The satisfaction of producing an acceptable image can be quite intense. It does not happen immediately and demands a great deal of practice to achieve. Hertford Art Society runs Life Workshops in Cowbridge Halls, Hertford, SG14 1PG on the last Saturday of 9 months during the year. Although these are primarily run for Members we welcome enthusiastic visitors at £16.00 per session (£8.00 per half day), this includes coffee, tea and biscuits, available all day. The sessions are untutored and last from 10.00am – 4.00pm with a break of 1hr at lunchtime. We work in in all mediums including prep work for sculpture. Bring whatever medium and equipment you require with you. The photographs below illustrate the exciting variety of work produced by the artists. There are many different approaches to life drawing which become very obvious during the sessions. We are a very enthusiastic group artists and in a relaxed atmosphere we learn from each other different skills and methods of working, as well as experimenting with different mediums etc. There are normally 2 models unless the group is small, when there is only one. We do not have a set programme of poses, but usually include short poses, mostly in the morning and longer poses for artists who wish to produce a more finished piece of work. So why not join us if you haven’t already. Workshops take place on the last Saturday of the month for nine months of the year. They do not take place in April, August and December due to the annual Open Exhibition and holiday periods. If you are interested please contact workshops@hertfordartsociety.co.uk for further details. Each year the Society is invited to paint seven large pictures to hang in All Saints church, Hertford to illustrate Hertford Choral Society’s Spring concert. 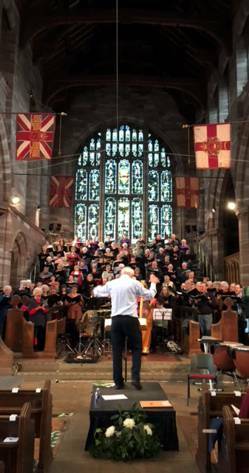 The concert is a very grand affair – a choir 120 strong, an orchestra of 50 professionals, four brilliant soloists and the conductor, Derek Harrison. The performance this year was Verdi’s Requiem, a dramatic piece requiring an augmented brass ensemble and a specially large ‘Verdi drum’ to give full value to the musical score. The libretto quotes ‘the trumpet, scattering a marvellous sound’ and it was this text that inspired paintings by John Jarratt, Brenda Thompson and Geoff Bennett. Persis Limbuwala fastened onto ‘May the holy standard-bearer Michael show them the holy light’, Jenny Stratford pictured a praying figure ‘suppliant and kneeling with a heart contrite as ashes’, and Janet Dobney picked up on the theme of figures climbing from the depths into eternal light. Chris Pantry, the one newcomer to our team of concert painters, opted to listen to the music rather than peruse the words. He imagined things rising upwards, heading towards a destination. As the music progressed he turned his painting upside down, to allow the paint to run down, so that the final effect would be of a medium defying gravity and normal conventions. A response to atmosphere: A depiction of things rising upwards, heading towards a destination. The seven pictures hanging down the central aisle of All Saints Church as Verdi's music burst out looked splendid – a testimony to the strong links between the Hertford Arts and Choral societies. Arriving at the Cowbridge Hall for this workshop, artists were greeted by an unusual and harmonious sound - members of Kleztopia warming up for a practice session. This was a departure from their usual get-togethers as they were to be sketched and painted throughout the evening while playing. Kleztopia perform traditional music from Eastern Europe and artist Marianne Dorn plays the violin in the group. Other members of the ensemble played guitar, bouzouki, clarinet and trumpet. The workshop was led by Abel Kesteven, an artist and sculptor who focuses, in his art, on interpreting movement and capturing the interaction between people. He often works in pastel, which he enjoys as it lends itself to quick "action" sketches. For full report, click here for more details. Kit Leese is a professional artist who has been painting and selling his work for the last 40 years. He has always had a passion for landscape and likes to paint on the spot, often in East Anglia where catching the immediacy of changing light across the landscape is key. Painting a garden is a major challenge – lots & lots of ‘stuff’, most of it green with some unpleasant brown. The challenge of demonstrating how one might tackle this was taken up by Kit who paints in a number of mediums but prefers watercolour, acrylics or gouache. The Vicar of All Saints Church, Jo Loveridge, asked the Art Society if artists would provide large aisle paintings to commemorate the hundredth anniversary of the signing of the armistice. A chance to paint & display large, dramatic pictures? Well, of course we would. The result was seven very different images – three were figurative (Chris Hewitt’s Christian Soldier, Gillian Harman’s scenes from the war in Egypt and Sudan, Geoff Bennett’s despondent ploughman); one – John Jarrratt’s ‘Everyone's voice was suddenly lifted’ - was largely textual; and three combined figurative and symbolic images (Janet Dobney’s Hertford Lad, a soldier returning to scenes from Hertford, Persis Limbuwala’s biplanes flying over text and poppies, Janet Benge’s wry reference to WW1 Propaganda). The overall effect of the seven pictures hanging down the central aisle of All Saints Church gave a varied representation of the Great War. The Vicar felt that these heartfelt images would be very well received during the service. They will remain on display for a further 3 weeks. [Left] Untitled - Janet Benge. [Right] Hertford lad - Janet Dobney. Exploding shells now churn the earth. He gathers up their bitter harvest. “Standing on the ridge it is possible to see what a lot of the country we have taken now." The 21st Members' Show took place in the well lit and spacious Cowbridge Hall in Hertford from 2nd to 4th November 2018. Two hundred framed artworks, submitted by 58 Members, were on show and browsers were full of unframed work. Thirty five pieces of work were sold as well as a good number of artists' greetings cards. 'Port Vale, Sunset' by Chris Baker - Oils. The range of subjects and styles made this a truly enjoyable show to visit, with something for everyone and prices to suit all. The Children's Quiz was appreciated by children and parents alike and, as usual, tea and coffee and cake were a popular attraction. Although Friday was a quiet day for visitors, the weekend was particularly busy. Everyone who visits and revisits the show has their favourites. The problem is choosing which one to vote for! Particularly popular among the visitors were the following: 'Nose in the Air' (camel) by Donna Chamberlain; 'Quinbury in Winter' by Sandra Edney-Lynch; 'Ladies at Ascot' by Jill Elliott; ' Rose and Cow Parsley' by Stella Green; 'Tufty' (squirrel) and also 'Alpes-Maritimes' by Pete Kelly; 'Gazebos, Ware' by Chris King; 'South Devon, plein air' by Craig Lee; 'Strolling in the Sun' by Linda Radford; 'Lion No.1' by Alyson Sharpe; 'A Sunny View' by Paul Swinge and 'Panshanger Country Park' by Fiona White. Rob Wareing was born and grew up in South Africa and still spends a great deal of time there. He studied the techniques of traditional classical painting and became a professional portrait painter at the age of 23. Since then he has had a very fulfilling career spanning over 40 years. He has painted numerous portraits of people of all nationalities and travelled extensively. His work is regularly featured in art magazines. He runs workshops, has demonstrated (on TV and YouTube) and published DVDs of his tutorials. We are delighted to welcome Rob and his model, Amanda Allen, for this demonstration. He has prepared a canvas, painted in muted shades of acrylic - a typical background to his portraits. His first step is to sketch the model lightly in charcoal, indicating the features and measuring the distances from hairline to eyebrow, eyebrow to mouth, mouth to chin. This initial drawing is critical. He measures and plots the relationships of the model’s features, sketches in the hair, the curve of the cheek and roughly indicates her clothes. The eyes are boldly drawn followed by the nose and the lips. He remarks that the drawing will alter as the painting progresses. He then sprays the sketch to prevent the charcoal mixing too much with the paint. From September each year Society Members and visitors enjoy a Programme of talks, critiques, demonstrations and workshops. These sessions are on Tuesday evenings from 7.30pm to 9.30pm at Cowbridge Hall, Cowbridge, Hertford SG14 1PG. Approximately half the evenings in the Winter Programme are for Members to paint or draw either from still life arrangements or a life model. The remaining evenings are taken up with talks, critiques of paintings brought along by Members, demonstrations from a professional artist or workshops. Visitors are welcome to enjoy the non-practical evenings (marked with an asterisk). That expression describes simply the wonderful weather we have experienced for our outdoor sketching evenings this summer, which was in complete contrast to last year’s cold and dull Tuesdays. For over 25 years now I have organised the Hertford Art Society’s Summer Programme and do not recall better conditions. For the start of the Art Society’s Summer Programme we met around the Port Hill area of Hertford, followed by a Tuesday evening at Dobb’s Weir then another at Chapmore End Pond. The weekend at Blakeney in early June was thoroughly enjoyed by those attending with good work produced. David Hyde is a self-taught professional artist who lives and works close to the river Great Ouse in St. Ives, Cambridgeshire. He has combined a keen interest in wildlife and bird watching with a life-long passion for painting. Having worked mainly in watercolour, David has, over time, developed a technique in acrylics to suit his style of portraying wildlife. He works mainly from photographs and had chosen an image of a barn owl against a dark background for his demonstration. He favours MDF board as a support, primed with several layers of Liquitex gesso on both sides and then sanded to a smooth finish as fine brushwork and detail is needed for wildlife painting. (He uses a board cut to the size of his framed painting with the area for painting masked around. The process of adding a mount and framing is thus simplified.) He favours Liquitex Soft Body acrylics as they can be applied thinly, rather like watercolour, without loss of colour. He uses a Liquitex medium to thin the paint and normally paints standing with the work on a tilted board. A small group of artists from the Society enjoyed an extensive pre-arranged tour of Exhibitions, Studios and Gardens at the Henry Moore Foundation at Perry Green, Much Hadham. Our Guide, Diana Dale, was extremely knowledgeable about the life and times of Henry Moore and gave us an insight into his early life and emergence as a sculptor, his working practices and the themes his work followed throughout his career. The current Exhibition - Out of the Block - displays some of his early carvings alongside later pieces which echo his abiding themes. These are: the reclining figure, mother and child and forms within forms. (This Exhibition runs until October 2018.) There are huge sculptures within the grounds and many in the various studios that we visited - they ranged from a tiny dog (his first effort at sculpture) and grew in size over the years to spectacular forms to walk around in, such as his last sculpture, Large Figure in a Shelter, 1985-86. Depending on location and commission some had to be made at foundries abroad and at home. The charming coastal village of Blakeney was historically a medieval commercial port transporting spices and oriental cloths, as well as a few smugglers! The estuary today is an amazing landscape of marshes, mud banks and sand hills. It made an ideal venue for the Hertford Art Society annual art weekend. Malcolm Norris from Lea Valley Art Society joined us on our trip to Blakeney. Inviting other art groups is something we will continue to do in future as it opens up the club to all who are interested in painting outdoors. So feel free to invite others. The members who took part all agreed that Blakeney was ideal for painting, it would have been better if the sun had shone on Friday and Saturday but still it managed to do its job on the Sunday enabling me to produce a pallet knife oil painting of the harbour. The dining experiences were memorable with an above average Fish & Chip meal on the Friday night in the White Horse followed by a top notch private function at the Blakeney House Boutique B&B. The chef excelled himself and for the second year HAS members gave the Chef a round of applause at the end. Accommodation at the Blakeney Manor Hotel was comfortable and well priced. Next year we are thinking of discovering Aldeburgh and plan to take in Snape Maltings. Depending on what’s on we may go to a concert. This will take place on the first full weekend of June 2019 so please book it in your diary. Members will be advised as soon as details are available. Remember, feel free to bring non painting partners and/or painting friends. The style of this Exhibition varies year by year. The selection of work for a place in the Exhibition is made by a panel of four eminent, practising artists who are completely independent of the Society. This year we were delighted to welcome Abel Kestevan, David Sawyer and David Ord-Kerr as judges for 2D work and Jim Brown as the judge for 3D items. The range of expertise and opinion of the judges and the wide variety of work submitted each year, ensures that each show has a unique mix of artworks. This year 145 artists submitted 562 items for consideration. 269 2D works were selected for hanging and these, together with 27 sculptures and 3D items provided visitors with a diverse, colourful and exciting 66th Open Exhibition at Cowbridge Halls. The exhibits included etchings, lino and screen prints; digital images; oils, acrylics and watercolours; pastel, pencil, charcoal and ink; collage; 3 D works in a variety of materials. A quiz helped to keep children engaged as they searched for elusive entities. There was something for everyone: atmospheric landscapes, townscapes and seascapes, abstracts, figures busily texting, storytelling or on a busy pedestrian crossing., still life images (abundant fruits, flowers, melons and jugs), butterflies, puffins and elephants. Some works were delicate, others rich in colour and boldly executed. Many, this year were in monochrome, ranging from large pen and ink scenes to exquisite life studies in pencil. Additional works were displayed at other venues in Hertford. Open for an entire fortnight the exhibition attracted many visitors from a wide area. Hundreds of visitors cast their votes for their favourite exhibit - the winner was Storm over NYC by Chris Hewitt. The joint runners up were The River Beane, Hartham Common by Fiona White and 42nd and Lexington by Michael Lawrence. Thanks go to all the people who contributed in making this, the 66th Open Exhibition, such a success - it was another exciting and popular show. The John Goss Prize for the painting the judges considered best in show - 'Punk Portrait', William Carney. The Lady Laming Award for Abstract Art - 'Still Life', Brian Innes. The Bill Dale Award is chosen from works by Members who regularly support the whole of the Society's activities - 'Blue Storyteller', Marianne Dorn. The Mayor's Award for the best 3D work sponsored by The Arts Society East Herts - Crouching Hare', Anne Gascoigne. Commendations were awarded to Kathy Burman for “Labyrinth Echo” and to Maria-Luisa Wilkings for “TheScrum”. The Edward Mason Brushes Award for the best watercolour - 'Vaporetto Venice', Andy Lee. Visitors’ Choice Award - ‘Storm over NYC”, Chris Hewitt. The joint runners up were The River Beane, Hartham Common by Fiona White and 42nd & Lexington by Michael Lawrence. 20 or more artists ventured along (somewhat nervously) to this Workshop armed with pencils, paints etc and each with a mirror. Each set up their mini-studio, some with rather smart mirrors on stands, others with small mirrors attached somewhat precariously to the top of an easel with masking tape. After settling in, a hush descended as each of us made tentative marks on canvas or paper in order to start this most challenging of tasks. We measured, gauged angles, tried out positions and wondered if Rembrandt and Van Gogh ever felt this anxious when face to face with themselves. Some of us stuck to pencil and charcoal, others mixed paint, and fretted about colour and tone as well as whether both eyes were the same size. The Society's aim is to encourage interest in the visual arts and to provide opportunities to practice, study and exhibit art in Hertford and the surrounding area. It is well regarded for the high standard of artworks on display at the annual Open Exhibition. Submissions are received from across Hertfordshire as well as other parts of the country. Members work in a range of media and styles from traditional painting in oils, pastel, watercolours and acrylics to printmaking, collage, multi-media and digital – computer based imagery. Three dimensional work in wood, clay, stone and metal is also well represented. This diversity and an approach to art which values traditional skills alongside contemporary art forms combine to make Hertford Art Society a leading light in the local art world. May 4th Saturday Open Exhibition - Hanging and Private View. May 5th-18th Open Exhibition - Open to general public. For more details click here to see our calendar page. 66th Open Exhibition prizewinners, 2018. John Goss Prize for Best in Show, William Carney, 'Punk Portrait'. Lady Laming Award for Abstract Art, Brian Innes, 'Still Life'. Bill Dale Award, Marianne Dorn, 'Blue Storyteller'. The Mayor's Award – best 3D, Anne Gascoigne, 'Crouching Hare'. The Edward Mason Brushes Award – Best Watercolour, Andy Lee, 'Vaporetto Venice'. Visitors’ Choice Award, Chris Hewitt, ‘Storm over NYC'. HAS would like to welcome Art Van Go as a new sponsor. Our early members may recall a small white van (thus the Art Van Go) that for many years called in to all the art societies selling art materials just as the artists were about to run out. Today the knowledge on materials Art Van Go have is unsurpassed and we see their association and their sponsorship as a mutual benefit for all concerned.